Here it is, just in time for the warmer weather! The Tin Coast (Arvor Sten in Cornish) is a stretch of wild and jagged coastline in West Penwith, Cornwall. It is somewhere I like to return to whenever I get the chance. 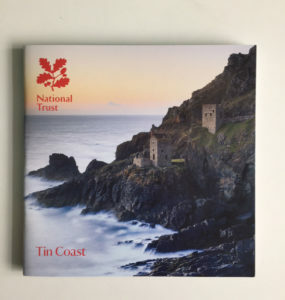 The landscape is dramatic and exciting – granite cliffs, secluded valleys and coves, and blustery headlands – and the relics of its tin mining past, including the famous engine houses, The Crowns, are fascinating. So it was a genuine pleasure to write the guidebook to the area. Research saw me tramping along the coastal path, chatting to National Trust mining and wildlife experts, and trying to place where Ross Poldark might have passed on his mighty steed (the TV programme based on Winston Graham’s books, is part filmed here). My favourite part of the coast is one less-visited: Cot Valley, which I always have difficulty finding but is well worth the trouble. Tucked away at its end is Porth Naven, a beach comprising huge, smooth, ovoid boulders (named ‘dinosaurs eggs’) that make a perfect perch to sit and watch the ocean or to keep an eye open for migrating birds.